A - B - Seymour: Will you host a Flat First Grader?? We have been reading about Flat Stanley in our classroom. We have already read the first book and now we are on to the chapter books. My kiddos are loving them! 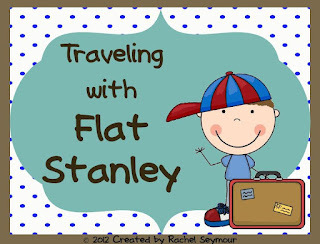 I created a Flat Stanley Pack last year that we are using again. 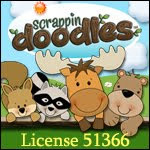 It has reading and writing activities along with a Flat Stanley project and a Flat First Grader project. You can visit my post about it from last year here. I have 2 copies of a Flat Stanley. Each weekend 2 kiddos get to take him home and spend the weekend with him. They take home a parent letter explaining everything and a journal page that they fill out. They write about what fun things they do together and then either attach real pictures or draw pictures of their weekend together. I've told my kiddos that Flat Stanley is kinda like our class pet. He hangs out with us all week and then goes home with someone on the weekends so he doesn't get lonely. They love this! We have also made Flat First Graders. Each kiddo has a flat version of themselves which we mail to friends and family across the country. This is where I need your help!! 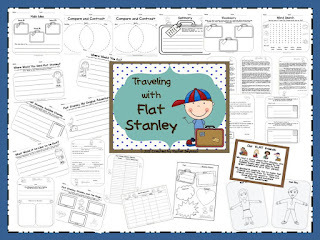 I have a few kiddos who don't have anyone to send their Flat First Grader to and they're so sad.... :( Would you and your class be willing to host a Flat First Grader for a few days???? It's really easy. Take a few pictures of your adventure and fill out the journal page so we can learn a little about where you live. We have several going to other states so we can learn about places outside of Ohio. We'd love to learn about more states or even other countries!! If you're interested, please leave me a comment or send me an email at rms273@gmail.com and let me know! We love Flat Stanley! Our first grade class is in Walhalla, South Carolina. I'm also originally from Ohio. :). If you still need help, just email me at smabry@oconee.k12.sc.us. Oh My Goodness! We would LOVE to host a Flat Stanley. I teach 17 darling first graders in Cambria California. Think they would be thrilled to be communicating with someone in your class. Please let us help. I would love to help you out! I live in Durant, Oklahoma. I have 24 firsties that I know would love to help too! Let me know what you think! Wow! How fun! My babies would LOVE to have a Flat First Grader!! :) Shoot me an email and I will send you my address! That would be fun! We're in Keystone Heights, Florida (about an hour or so south of Jacksonville). I'm originally from Ohio too! If you still need someone, let me know! I can help, if you still need some help. We would love to participate. I live in NC.